Exciting Train Rides in France ! We have been finding out about some unusual train expeditions in France. 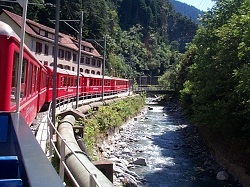 The Petit Train Jaune or "The Little Yellow Train"
Travels into the high Pyrenees from Villefranche to Latour de Carol. The station it starts from is the highest mainline station in France and it then proceeds to climb higher into the mountains ! Possibly not for the faint hearted but watch this video to find out what the journey might be like ! http://www.youtube.com/watch?v=NicKaeAuMoI and this one as well with an open carriage. 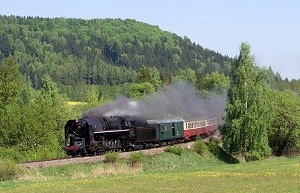 The train has steep sections, which if it had been built 15 years earlier would have required a "rack and pinion" system, but instead the train has motors right along the train, spreading the driving force etc. The starting station can be reached by train or car from Perpignan in Languedoc Roussillon, SW France. From Chamonix (Gare de Chamonix-Mont-Blanc) to Vallorcine then from Vallorcine you change train to Martigny in Switzerland. The trip to the Vallorcine (French/Swiss Border) is very picturesque, and you then change trains for the trip to Martigny in Switzerland, This is a very scenic route through the mountains where you are perched on the side of the mountain !. The scenery is breathtaking and you can see for miles. You then you go through the mountain for the steep descent into Martigny. You almost feel like you are in an aeroplane as you cannot see much to the side. If possible, try and sit on the left when going to Chamonix and on the right from Chamonix, assuming you want to get the best views. Discover Corsica along an incredible journey between earth, sea and mountains. Nicknamed "U Trinighellu" (the trembling), the train connects Bastia to Ajaccio, with stops in Ile Rousse, Calvi or Corte. The train travels between land, sea and mountains, on an unforgettable journey through Corsica, through plains and valleys, streams, pine and beech forests and along the rugged coastline of the Mediterranean with views of incredible beaches and coves with white sand and turquoise waters. The journey starts in the Baroque city of Bastia in Corsica then coninues via Cardo, the town of Ile Rousse with its beautiful bay, then via Calvi. Then, finish your trip in Ajaccio. Surrounded by mountains and with one of the most beautiful shorelines. It is a great way to see the island of Corsica and en route you will spot such things as the traditional shepherds. With thanks to French train driver @Conducteur_SNCF on Twitter for some of these suggestions !